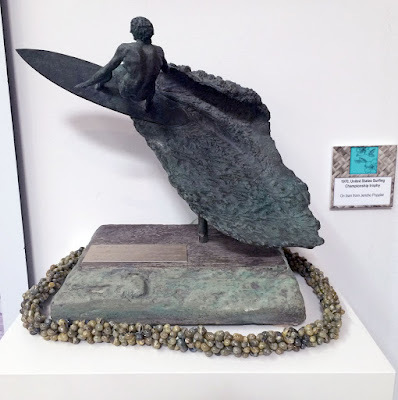 In keeping with our "Trailblazers in Women's Surfing" exhibit, this week we feature Jericho Poppler's 1st place trophy from the 1970 US Surfing Championships in Huntington Beach. It was made by the same sculptor that created the large version on PCH just south of the pier in HB. Jericho Poppler, competitor, organizer and innovator, has been a consistent force in women’s surfing since the 1960s. Raised in Long Beach, California, she started surfing at the age of nine. In 1970, she won the U.S. Championships, and consistently placed at or near the top of many other amateur contests. In 1976, Jericho won three of the seven events on the first world tour. She continued to be ranked near the top until the early 1980s. Jericho’s endless energy and drive lead her to be equally as active outside the water. She co-founded the Women’s International Surfing Association (WISA) in 1975 and Women’s Professional Surfers (WPS) in 1979, an organization to represent the interests of pro women surfers. In 1992, after retiring from competitive surfing, she reemerged competing in longboard contests. Jericho has also focused her efforts on environmental causes, including Surfrider Foundation, the Groundswell Society, and the Kids For Clean Water program in Huntington Beach. She presently sits on the Board of Directors of the Surfing Heritage and Culture Center.